Palestinian Authority President Mahmoud Abbas on Tuesday said he believed a future Palestinian state should be demilitarized, offering rare backing for a key Israeli demand in any peace deal. Abbas told a group of visiting Israeli academics that he preferred devoting funds to education and institutions than to an army, the Kan public broadcaster reported. Picture of members of the Iraqi force that prevented the occupation army from the occupation of Jenin in 1948, and rendered to them heavy losses. As soon as Abbas said he was against Palestinians having an army to Israelis, his political party celebrated how a conventional army managed to allegedly win a battle against the Jews. They pointedly chose a picture that included an armored vehicle, something specifically "army like" that their own police wouldn't have. Abbas' message, taken as a whole, is that it makes no sense for Palestinians to have an army when it has the entire Arab world it can invite to fight on its behalf. I do not recall ever seeing an image of a conventional army fighting Israel on the Fatah Facebook page before. Usually its historic pictures would be of "martyrs" or of downtrodden Arabs. 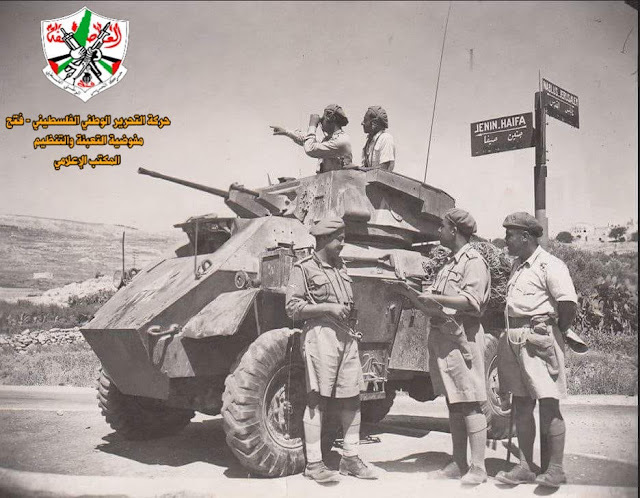 In the 1948 Arab–Israeli War, the city was defended by the Iraqi Army, then captured briefly by the forces from Israel's Carmeli Brigade during the "Ten Days' fighting" following the cancellation of the first cease-fire. Prior to the battle, the city's residents fled temporarily.The offensive was actually a feint designed to draw Arab forces away from the critical Siege of Jerusalem, and gains in that sector were quickly abandoned when Arab reinforcements arrived. Even their victories are not victories.